Southampton got the better of their south coast neighbours Bournemouth in the first top flight meeting between the two sides. 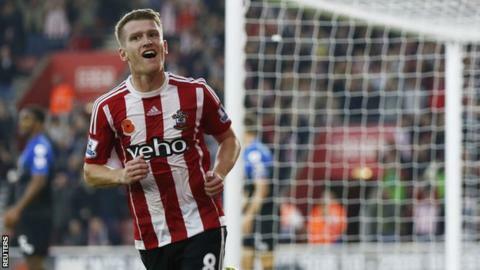 Steven Davis volleyed Southampton ahead in the 31st minute with a close-range finish from Ryan Bertrand's cross. Graziano Pelle doubled the lead within five minutes as he headed in Dusan Tadic's pinpoint ball for his sixth league goal of the season. Victor Wanyama was sent off after the break for a second bookable offence when he needlessly tripped Bournemouth substitute Lee Tomlin. But the Cherries, who had the better of the second half, were unable to find a way back. A fourth defeat in five sees Bournemouth remain just a point above the bottom three while Southampton stretch their unbeaten run to seven games in all competitions. Ronald Koeman's side are now three points off the top five and looking full of confidence in a week which also saw them reach the League Cup quarter-finals. They came out of the traps the faster of the two sides, who last met in League One back in March 2011. Both Sadio Mane and Tadic found space down both flanks in a dominant first-half display while Davis and Pelle, the two other pieces in their front four jigsaw, kept Bournemouth pinned back in their own half. Their wait for the inevitable opening goal ended when Davis peeled away at the back post to finish left-back Bertrand's searching cross, who also benefited from the added width granted to the home side. They had to show their grittier side in the second 45 minutes as the visitors tried to mount a comeback. Wanyama had been the architect of that patient approach until his sending off, but a sign of Southampton's current strength is how others seamlessly filled the defensive breach in his absence. Bournemouth came out for the second half with a new shape and added intent as Eddie Howe abandoned the five-man midfield which failed to cope with Southampton's width. Having conceded 10 goals in their previous two Premier League games, the Cherries' floodgates could well have opened after two quick goals went past Adam Federici. The introduction of Junior Stanislas and Joshua King at the break not only gave them added bite in attack, but it also pushed Mane and Tadic into deeper roles. But, for all their increased possession in the second half, chances were still at a premium. Even after Wanyama's dismissal, the Cherries were restricted to long-range efforts. Southampton goalkeeper Maarten Stekelenburg had little to trouble him until Tomlin and King fired shots straight at him in the closing five minutes. The Italian was on target for the second time in a week, having struck the decisive goal in Wednesday's 2-1 League Cup fourth-round win over Aston Villa. He found himself having to drop deeper in the second half, a side of his game many might not be too familiar with. Pelle is rapidly turning into Southampton's key player, having scored 15 top-flight goals last season and 10 goals in his last 12 home games. Southampton are unbeaten in their last six league meetings with Bournemouth (W5 D1). The Cherries have failed to score on six of their nine visits to Southampton in the league. Southampton are unbeaten at home in league competition against Bournemouth, winning seven and drawing two. Southampton's Ronald Koeman: "The first 45 minutes was the best football so far this season. Good movement and great goals. We learned a bit from the Leicester game at 2-0 to defend better. Always an opponent will give a reaction and you have to deal with that. We lost balls and had no control. We need to do that better. "In every Premier League game, even at 2-0 up is difficult. You need good defending and more control and to win every battle. Still, I think it was a very good performance. "We know we can play fantastic football. If we take that and learn from the second half, we will finish in a high position." On striker Pelle: "Yes, he's very important to us, we know he's a very good striker, scoring goals and he's strong. "In my opinion, he's one of the best in the Premier League." Bournemouth's Eddie Howe: "I thought the second half was everything we wanted the first to be. We were off the pace in the first half and Southampton played well. It was a reverse in the second but all that was missing were goals. "We wanted a bit more pace after the break. We got our passing rhythm going in the second half. The overall performance and work ethic was very good. "Technically we showed we can compete. Our passing and movement were to a high level. We need to cut out the mistakes." On whether he needs to buy a new striker in January to address a lack of goals: "The disappointing thing in the second half was we didn't have the cutting edge to create more. I wouldn't necessarily blame the strikers for that. "I'm not going to say that we need to buy a new striker. It's both ends of the pitch we need to improve and we'll be working hard to do that." Bournemouth face a crucial home game against fellow early-season strugglers Newcastle next weekend, before a trip to Swansea. As for Southampton, they visit bottom club Sunderland next before welcoming Stoke to St Mary's. Match ends, Southampton 2, Bournemouth 0. Second Half ends, Southampton 2, Bournemouth 0. Attempt missed. Adam Smith (Bournemouth) header from the centre of the box misses to the right. Assisted by Junior Stanislas with a cross following a corner. Corner, Bournemouth. Conceded by Cédric Soares. Attempt missed. Junior Stanislas (Bournemouth) right footed shot from outside the box is high and wide to the right. Assisted by Charlie Daniels. Attempt missed. Dan Gosling (Bournemouth) header from the centre of the box misses to the left. Assisted by Simon Francis with a cross. Attempt saved. Joshua King (Bournemouth) right footed shot from outside the box is saved in the bottom right corner. Assisted by Junior Stanislas. Attempt saved. Lee Tomlin (Bournemouth) left footed shot from the left side of the box is saved in the bottom left corner. Assisted by Andrew Surman. Attempt missed. Matt Ritchie (Bournemouth) left footed shot from outside the box is too high. Assisted by Simon Francis following a corner. Attempt blocked. Matt Ritchie (Bournemouth) left footed shot from outside the box is blocked. Attempt missed. Dan Gosling (Bournemouth) header from the centre of the box is too high. Assisted by Junior Stanislas with a cross following a corner. Corner, Bournemouth. Conceded by Sadio Mané. Substitution, Southampton. James Ward-Prowse replaces Dusan Tadic because of an injury. Corner, Bournemouth. Conceded by Maya Yoshida. Attempt blocked. Junior Stanislas (Bournemouth) right footed shot from outside the box is blocked. Lee Tomlin (Bournemouth) wins a free kick in the attacking half. Dusan Tadic (Southampton) wins a free kick on the right wing. Attempt missed. Victor Wanyama (Southampton) right footed shot from outside the box misses to the left. Substitution, Bournemouth. Lee Tomlin replaces Harry Arter. Substitution, Southampton. Oriol Romeu replaces Jordy Clasie. Attempt missed. Harry Arter (Bournemouth) left footed shot from outside the box misses to the right. Assisted by Adam Smith. Attempt blocked. Charlie Daniels (Bournemouth) right footed shot from the centre of the box is blocked. Assisted by Dan Gosling. Corner, Bournemouth. Conceded by Virgil van Dijk. Attempt missed. Junior Stanislas (Bournemouth) right footed shot from outside the box is close, but misses to the right from a direct free kick. Attempt missed. Dusan Tadic (Southampton) left footed shot from outside the box misses to the left. Assisted by Graziano Pellè with a headed pass. Offside, Bournemouth. Simon Francis tries a through ball, but Junior Stanislas is caught offside. Dusan Tadic (Southampton) wins a free kick in the defensive half.